This is the first biscotti I ever liked, and even though I’ve tried a lot of biscotti since I first made them, they remain my favourite. I’ve made chocolate ones, cinnamon ones, and espresso-hazelnut ones. They’re all very good, but the lemon almond cornmeal biscotti is my all-time, classic, blue-ribbon winner. It is inspired by a recipe in Dorie Greenspan’s classic book “Baking: from my home to yours”, a recipe titled Lenox Almond Biscotti. 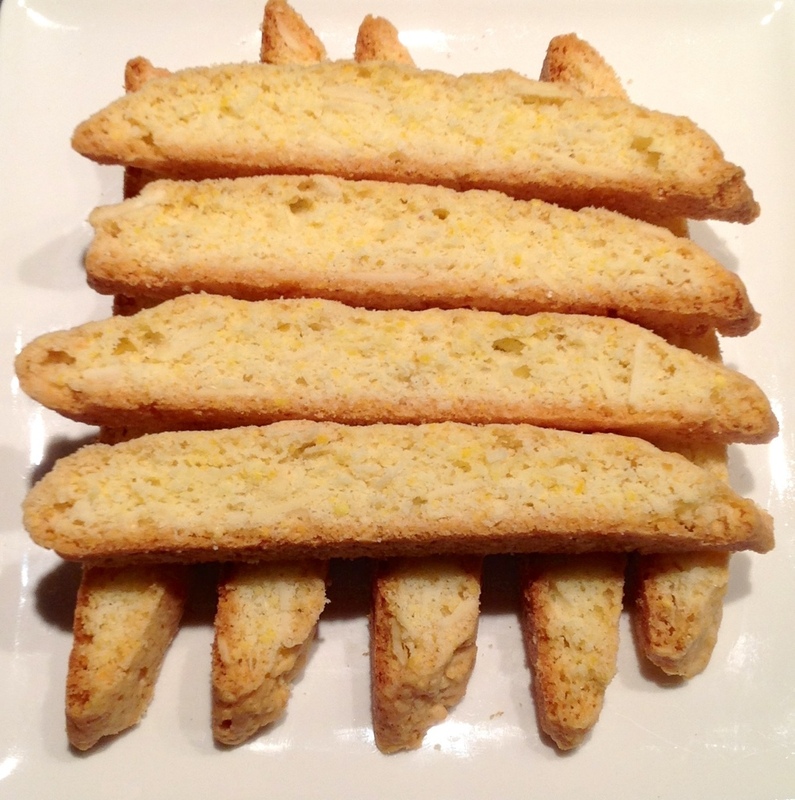 Over the years, I’ve increased the lemon zest and decreased the flour and tinkered with it dozens of times, but from the first time I made them, I fell in love with these lovely crunchy, lemony, almondy, buttery and tender biscotti. Bonne Année! Feliz año nuevo! However you like to say it, I’d like to wish everyone a great year ahead, full of tasty treats and growing friendships. Looking forward, 2013 promises to be sweet (pun intended) and full of tasty new experiences. I am grateful for all the encouragement I’ve received from so many well-wishers. It’s exciting to discover so many others who share my passion for baking. Due to demand, I’ve decided to make extra caramels, brownies, and biscotti for the holiday season. For years, I’ve shared my love of caramels and baking with family and friends. I enjoy presenting someone with an unexpected gift of homemade caramels- the look of delight on their face when they taste their first one makes it all worthwhile. As a gift for loved ones who live across the country or across the globe, caramels are perfect for shipping as they last for weeks, and survive well in the mail (unlike the fragile shortbread cookies I used to send). Welcome to Carpe Cookie Confections! This is my first blog post. Ever. I’m a little nervous but also excited to share my world of caramels, cookies and cakes with you. Here I plan to showcase many of my favourite treats and hopefully they will soon become yours too!